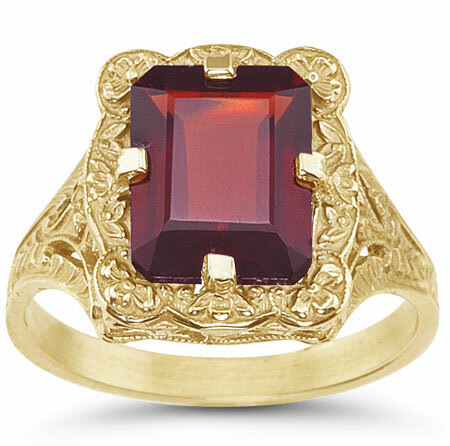 Apples of Gold Jewelry brings you an incredibly unique ring with this antique style rectangular emerald-cut garnet ring in 14K yellow gold. This ring, which is modeled after rings sold by jewelers between 1700-1900, is a stunning ring for all occasions. The large, 10mm x 8mm authentic garnet stone is deep red in color, and is rated AA. The emerald cut stone is beautifully paired with 14k yellow gold, taking you back in time and winning your heart! We guarantee our Antique-Style Rectangular Emerald-Cut Garnet Ring in 14K Yellow Gold to be high quality, authentic jewelry, as described above.